Refer to main accounts page for other chase days not listed here. Significant tornado outbreak across Arkansas. Mostly HP supercells produced numerous long-lived tornadoes that resulted in heavy damage and 26 deaths. I was unable to be mobile this day, however I captured some impressive shots of an occluded meso and its associated RFD. 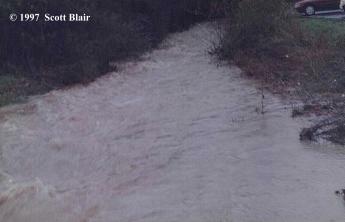 I later took flooding shots across potions of Little Rock. I observed two supercells across Central Arkansas, the most impressive located near Jacksonville, AR. 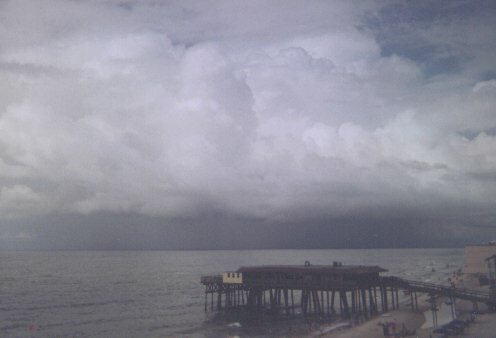 The cell was placed under a tornado warning, with one brief tornado reported. Later that night, I shot video of another intense cell with continuous lightning. Photos Forthcoming Marginal supercell developed NW of Little Rock and slowly moved northeast to south of Conway. I shot video of the nice structured cell at twilight with impressive cc bolts. Observed a turbulent shelf cloud under a severe t-storm warning. The storm produced 50-55mph wind gusts. Decent still photos early in the storms lifetime. Photos Forthcoming Slowly moving cold front glanced the region, providing increased dynamics and scattered severe storms. Pretty shelf cloud contrasted with a field made for an interesting sight. The shelf was followed by a decent display of cg lightning with a few close strikes and heavy rainfall. Took a vacation to the gulf region and observed a nice cell. Dynamics were improved thanks to a cold front approaching the coast and sea breeze interactions. Several "lowering" were observed, which at times appeared to have the potential for a waterspout. Outlow boundary helped initiate a supercell across North Central Arkansas during the evening hours. The storm produced two brief tornadoes. I observed the strucutre from Maumelle, AR and decided not to pursue the storm due to sunset approaching and the expected weakening of the cell. 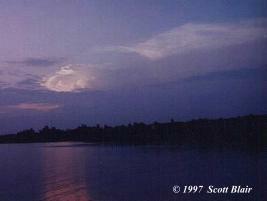 The structure consisted of a hard anvil, nice mammatus, and a hard updraft all exposed golden at sunset. Photos Forthcoming George Hoelzeman and I observed a high risk bust. We targeted a cell near Benton, which produced some decent wind and lightning. However, all storms were lacking decent instability due to low clouds early in the day that limited surface heating. Early monring storms developed across the state. I did not chase, instead set up to photograph the lightning. Halloween morning was my first successful still of lightning. 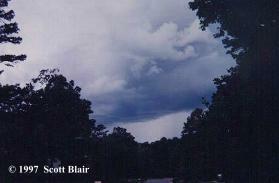 Photos Forthcoming Observed a severe storm as it moved across Pulaski County. Decent shelf cloud was photographed. Measured hail from pea to just under dime sized along with strong wind gusts. 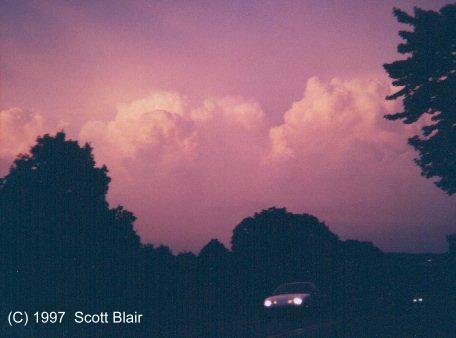 This was my only hail encounter of 1997. Photos Forthcoming An intense upper level low produced some low-topped supercells across Arkansas. George Hoelzeman and I chased one such storm around 8pm near Ferndale, AR. 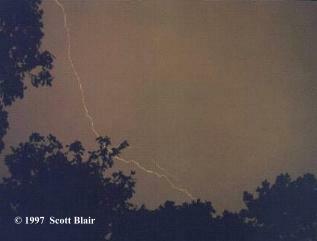 Due to the low storm top, lightning production was only fair and observations were difficult. However, a nice inflow tail and base were observed.